Happy New Year! Since I hung out with friends last night I thought it would be fun to share some pictures from that in my Step Into My Week post which is why it's not live today. Fear not though, it will be up tomorrow and then should be back on its typical Monday schedule. Hi my name is Dorothy, and I've admitted before how indecisive I can be. Yet, here I am sharing 25 of my favorite products of the past year. While I'd like to think this does a pretty good job of encompassing all of my favorite things from the past year I'm sure I'm missing a few things. From groceries to scents and even books and stores these products have been my best friends throughout the year. As we enter into the new year sometimes we look for ways to simplify our lives and sometimes we are looking to treat ourselves. I'd like to think that based on how much I like these items that they are a daily treat for myself. I've included a short snippet of why I love these items underneath each in case you're looking for an added nudge when it comes to making them one of your own favorite items as well. After becoming dependent upon coffee within my first year teaching, travel mugs have become an essential. While these cute ones don't keep my coffee hot forever, they do remind me to drink it in a timely manner to ensure I'm alert come time for school to start. I received two of these monogrammed euro shams at the beginning of last year and adore them. I definitely think that they make my room look more sophisticated, and I know I will have and enjoy them for years to come. Last Christmas I received a roller ball of this perfume and used every last drop. I can't say that about very many perfumes I have despite how much I love how they smell. I was so glad to open up a full size set of this perfume on Christmas morning, and I am excited to make this my signature scent this year as well! If my friends could sum me up in one scent let's just say it wouldn't be the perfume mentioned previously. Nope. It would be Glamorous Wash detergent in the scent Diva. To say I am obsessed with this is a complete understatement. This was the first thing I purchased when I received my first paycheck after spending half of the summer without it. My little in my sorority discovered I was her big because the t-shirts I gave her smelled like this. I gave my co-workers tiny bottles of this for Christmas. Most recently, thanks to a gift from Nell, I discovered that now my car and drawers can smell like this detergent with the car freshener and sachets I received. It is arguably the best splurge item I own. A little hint for you, use a scentless detergent and add one cap full of this product to get the same great smell but have your bottle last longer. This summer I got hooked on Beauty Counter. I had had some of their products in the past that I really loved, but I tried a new combination of products and couldn't get enough of them. This Countermatch Lotion is the absolute best face moisturizer I've used. The product adapts to your skin's needs and leaves my skin feeling refreshed and so soft. I have come to adore Beauty Counter and their mission of safer skin care so much that I've chosen to become a consultant for their brand (something I NEVER thought I would do), and I can not wait to share more with y'all about that soon. I was completely oblivious to all the harmful chemicals I was putting into my skin, and I am so glad to have found a brand that eliminates that while giving my skin exactly what it needs with the products offered. Working out in the cooler months has been a tricky balance. From deciding whether to go on a run when I get home or go to barre 3 dressing for the workout is important. This year has been colder than ones past. I've been loving these Lululemon long sleeve shirts to keep me comfortable during both workouts in the chillier months. It's official, I can't move anywhere that doesn't have a Trader Joes. I make a trip at least once a week to pick up groceries from Trader Joes and am embarrassed to admit how many times each week I eat their frozen meals or soups. For those of you that don't have a Trader Joes, I am so sorry. Great products, great prices, and keeping me alive on my own in the real world, definitely a favorite! Although I've only had the tote pictured for about 6 days, I use my other 2 Barrington Totes all the time. They are durable, customizable, and functional for so many different things. If you have a job where you take a tote bag a Barrington Tote is the way to go! I can't wait to start using this one as I head back to school. Who knew that a brush had such an impact when it came to drying your hair? Apparently the Drybar knows how it is done. After beginning to use a round brush last year and starting with one from Target come time for an upgrade I splurged on this one. It has made blowdrying my hair so much faster and does a much better job of controlling my hair than other round brushes. I'm all to get my hair pretty straight while blow drying alone thanks to this hairbrush. I am so glad that slip on shoes have continued to remain in style. The grey pair I own are definitely some of my most worn shoes from October until April. They are a much more comfortable alternate to flats, and they look surprisingly cute with jeans or leggings. If you don't have a pair yet do yourself a favor and indulge in this comfy favorite. It is rare that I don't have nail polish on my nails. Maybe every two years I'll go and get a manicure, but other than that I prefer to paint them myself. I've built up quite the nail polish collection over the years. I still remember the first time I painted my nails in my dorm freshman year a little while before bed and Nell looked at me slightly confused with my timing for the activity. Little did I know at the time she spends a solid 2 hours when going through the process of painting hers. This Gel Top Coat coupled with a quick dry top coat make my nails look like I've had them done while taking under 10 minutes to complete the color change. I ask for a new one of these top coats each year in my stocking and will be surprised if I ever discover something better. I knew I needed to mention at least one school surprise in this post since with teaching I am surrounded by them constantly. Flair pens are pretty much every teacher's favorite. I have quite the collection on my desk and use them for lesson planning, writing on my calendar, and grading. The bright colors make boring to-do lists and tasks a little bit more fun! I think I would be embarrassed to know how many La Croixs I've consumed in the past year. I constantly have some in my fridge in the apartment and in my classroom. Fortunately, I don't feel bad about drinking these since they are hydrating and refreshing. My favorite flavors are lime, berry, tangerine, and pamplemouse. I'm keeping these tidbits about each item short but I can and have written at lengths about my love of my Day Designer. If you're in need of a daily agenda with enough room to schedule out what you're doing at various times throughout the day as well as a to o list this should be your go to. I know I raved about Beauty Counter all of 9 favorites ago, but it really is good enough to be mentioned twice. I love a good face mask and their brightening mask does exactly what it says. My skin feels refreshed and brighter which is ideal especially in the winter months. I have had these for 1 month and they are worthy of this list. Seriously, that good! I am super picky when it comes to jeans. I want them to look like a true dark denim but would prefer that they felt like pajamas. Well friends, these do just that. And they are about $30 from Old Navy of all places. I didn't believe it either until Sophia couldn't stop raving about them. Here I am now singing their praises after giving her recommendation a go. Do yourself a favor and order these now. You can thank me all winter long when it feels like you're putting on pajamas when getting dressed. As for sizing, these are definitely stretchy. I got them in a size four since that's all that I could find in store (I'm thinking everyone is loving them as much as me) but probably could have gotten a two. I have the smallest ear lobes and was convinced that I would never be able to find earrings aside from studs that looked normal. Now, I've ventured into all sorts of earrings and that is all thanks to these hoops. I wear these hoops at least twice a week. They are classy, light weight, and are such an easy way to dress up an outfit a bit. Hands down my favorite book of this year. I love self-help/inspirational books, and this summer I went on a reading craze. I would go from psychological thriller to self help book back and forth all summer long. Having a pool to enjoy was great but a pool to enjoy with a great book was even better! Even having read a number of books this stands out above all the others. I read it in 24 hours and still haven't stopped raving about it to friends. It's so relevant to life right now and was more encouraging than other similar books I've read. Sometimes after reading a self help style book I feel like I have a laundry list of things I need to do in order to succeed. This one left me reassured that other people are going through the same sorts of things. The work section was my favorite, and the idea of having strength in weak ties was super enlightening. If you read anything in 2018 make it this book! p.s. for more about it see this Novels With Nell where Nell and I both rave about it. As I am sure y'all know, sometimes blogging comes along with free stuff. I am *very* picky when it comes to what I feature and make it a point to write sponsored posts in a way that are super informative for you while sharing the brand or product in a genuine way. I think that if I'm getting paid for something then both you and the brand should get your moneys worth. Working with Michele Watches was one of those speechless moments where I had the opportunity to work with a brand that I never thought would know my name. They reached out about a graduation instagram post (see it here) and them sending me my Michele Watch was one of the best gifts I could have gotten. I even featured the watch in a blog post of what to wear for graduation and haven't stopped featuring it in outfit posts since. I wear mine constantly and know I will for years to come. While it is certainly an investment, the cost per wear will be minimal when I am still wearing this 5, 10, 15 years down the road. This as another discovery made through the opportunity to feature a brand on my blog. Boy am I glad to have discovered this too. As I'm trying to learn how to balance a full time job, personal health, grad school, and a blog finding simple solutions to every day chores is the best. Shipt is a grocery delivery service that costs $100 per year and will be worth every single penny. I can order groceries to be delivered at whatever time is convenient for me from some of my favorite stores. Target just bought the brand meaning that before long I can get Target items delivered to my apartment too. Major win. I was trying to think about what my favorite snack this year was and came to the conclusion that Pirate's Booty is definitely it. I'm not going to rave about this long because if you've tried it you know how yummy it is and if you haven't then you need to try it for yourself. Tuckernuck has been my favorite online store for a number of years but this year especially. While I love Nordstrom and the variety they offer I prefer the more unique styles offered on Tuckernuck's site. Now that I've begun a job I have been on the hunt for professional clothes that are still cute enough to wear outside of the classroom. Tuckernuck's pieces offer just that! Fun fact about me, I've owned the same pair of Ray Ban aviator sunglasses since eighth grade. Take that in for a second. That's 10 years of the same pair of sunglasses. I have other pairs I love but am so partial to those because they actually fit my face's frame. Why is that? Because they are child size...Yep, I'm 23 and child size sunglasses look normal on me. As you can imagine that makes finding sunglasses that do not make me look like a bug a bit tricky. After continually coming back to these Madewell sunglasses I finally purchased the tortoise with blue reflective lenses pair over the summer. Needless to say, they worked and I love them. I love them so much in fact that for Christmas I got another pair of the same sunglasses without reflective lenses. If you have a smaller face these may just be a better solution than child size sunglasses. Y'all probably know how much I love everything that Evelyn Henson does already. Over the years, I've built quite the collection of her adorable artwork including many coffee mugs from her. These mugs make my favorite list because they are the perfect size and make me smile when I get my fist cup of the day at 5:40. We have them displayed on our coffee/bar cart and I love the whimsical designs and sassy sayings on them. Most of the time running our dishwasher revolves around needing to get our favorite mugs out to use again! Last but not least, Smith's Rosebud Salve. This made the cut last year as well if I remember correctly. I have pretty dry skin in the winter and that includes my lips so this chapstick is a saving grace. I keep one in my car, my desk drawer, and on my bed side table so that I am never without. While I do love other chapsticks I appreciate the fact that these come in tubes so I don't have to make sure my hands have just been washed like I feel like I need to with salves in a tin. Since I took the time to go through the analytics of purchases in addition to posts I thought it might be fun to share what products y'all clicked and purchased the most. I feel a little bit creepy knowing these stats, but if I know them why not share them as well. This sort of information is so fascinating to me so hopefully y'all will find it equally entertaining. First, for the most clicked items from each month. 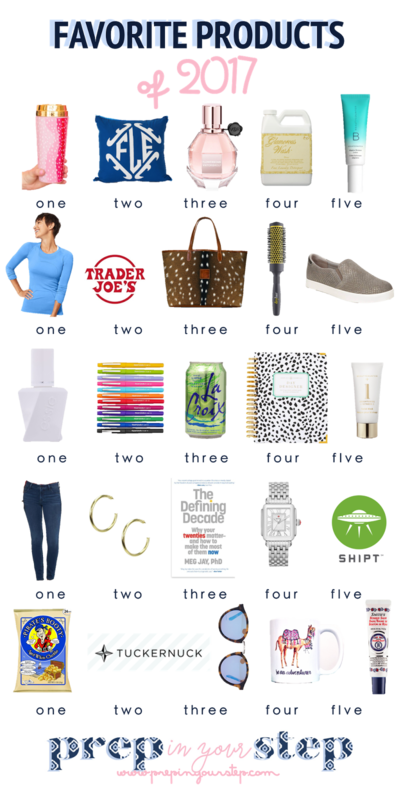 As you can probably guess on your own, these items were what y'all clicked most, but didn't necessarily purchase online. Second, we have the most frequently purchased item from each month. This may only be interesting to me, but I thought I'd share it in case you're intrigued as well. I hope that each of you had a safe and enjoyable New Year's Eve and are spending today kicking off 2018 in a relaxing way!